The 2011 Nissan JUKE went on sale across Japan in early June, and sales of the car to date indicate there is a strong link between what JUKE offers and what customers are looking for. The story of JUKE is indeed an interesting one. It's an SUV, but it's nimble and sporty - something that under normal circumstances would be oxymoronic. But it's not just a crossover. It actually represents a whole new genre for NISSAN; the compact sports crossover segment. It is an area consumers are responding to in a big way. NISSAN Design Newsletter had the opportunity to sit down with three key personnel involved in the design of JUKE, Product Chief Designer Seiji Watanabe, Exterior Designer Takashi Noguchi and Interior Designer Patrick Reimer. Watanabe is a cheerful and very talkative fellow who looks a lotyounger than his 45 years. When queried about his main aims for JUKE, he mentioned three aspects; originality, presence and something called robiotic. "The car has to be compact but tough, giving it the feel of a larger vehicle. This also adds an element of 'premium' to the car and helps with the overall strong presence of JUKE. Just because a car is compact shouldn't mean it's cheap." Watanabe cited the importance of making something that hasn't been created before - and won't be copied by other manufacturers. This is true of another of Nissan's iconic models, which itself created a new genre, the CUBE. Robiotic is a mix of the words robotic and biological - representing the combination of mechanical and human elements found in the vehicle's design. Watanabe opined that when people see JUKE, they look at it more as a partner or pet than a transporter or mechanical object. "It's a little closer to human, and less machine - or object-like," he says. The lines of the car and the rounded theme seen throughout certainly give it an organic look, less angular and machine-like than one usually sees. The engineers faced many obstacles in designing JUKE, from the raised floor (and higher centre of gravity) to the bigger wheels and tapered cabin and short overhang at both ends of the car. Getting the vehicle's proportions right was a key element for the design team, and something on which they focused a lot of their attention. Surprising to some will be the relative similarity of the original sketches to the refined vehicle that's available to the public. But looks can be deceiving; there aremany changes and developments throughout the car, both to the interior and exterior, some of which are not readily recognizable. Watanabe also confides that a unique challenge in the design of the car was the rear door handles. "With the rear fenders so high up on the car, it meant designing handles that would be easy to operate from that position." 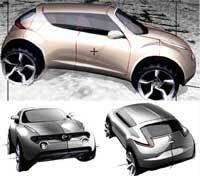 Like the X-TRAIL before it, JUKE is breaking new ground in terms of design for its genre, but as to whether there will be a line of cars similar in appearance to JUKE in the future, this is not expected. When asked about his inspiration for the car's design, Watanabe recalls seeing a messenger on a crossover bicycle (half road, half mountain bike) in London jumping the city's curbs with ease. "That gave me a hint towards the design initially. I wanted to create something for the urban jungle, but in a sporty compact vehicle – like that bike I saw." With its rugged and partially exposed underbelly and sophisticated cabin area, JUKE clearly ticks all boxes for those wanting the surefootedness offered by an SUV with the sporty compact feel of a sports car. Another design aspect that‘s most interesting is the car's roof, utilising a sloped half-pipe canopy, constructed of two rounded pillars. This allows for thelarge frontal area and smaller rear part of the cabin around the 'c' pillar. The Product Chief Designer claims to be satisfied with the outcome of the car, though would have opted for a greater range of available colours and materials had he had the choice. "JUKE is unique because when you drive this car, there's a feeling of excitement. That's the car's special point - its particular appeal. Unlike in the past, cars that are fun todrive aren't being offered anymore." He tells us that designing a car that combines good gas mileage with roominess, is inexpensive to run and has a light carbon footprint are difficult elements to balance out – but have been achieved with JUKE. "In my view, it is critical that a car has a personality. JUKE has originality, and when you either see it or drive it, it strikes a pose." He uses the Japanese term 'uramasari' – meaning reserved and poised on the outside, while being bright and flashy on the inside. This is reflected in the many bright accents found within the cabin, particularly the door trim, power window switches, and most of all, the centre console. Exterior Designer Takashi Noguchi has been at Nissan for most ofhis working life, though interestingly, was first employed by the brand as an engineer. After going back to school and graduating from a design academy, he was hired by Nissan Design, and has moved up to lead the exterior design team on JUKE. apart. JUKE is actually a sports car and the Boomerang-shaped rear lights show Nissan's sports car DNA - influenced by the FAIRLADY Z. It is of course, a lot more than that." The car had to be very different from anything else out there. Nissan already has SUVs like the Qashqai, so the sporty nature of JUKE needed to be shown – it's the differentiation of the car. The design process saw little in the way of compromises from thesketch phase to refined design – something very satisfying for the design team, and most uncommon these days. Each part of JUKE is very distinctive from a regular car – meaning it's also very difficult to produce. Aerodynamics is a very important point with the car. The original roof design was more angled at the rear, but to meet fuel efficiency requirements and other aspects, had to be re-designed. Meanwhile, the L-shaped rear lights, as well as being reminiscent of the FAIRLADYZ, also have an aerodynamic, flat surface, making them functional as well as beautiful. The design process hasn't all been easy however, Noguchi revealing that finding a solution to the pedestrian protection rules was an area that required special attention, and another reason the front of the car is so large - and positioned high up. "What I tried to do in designing the exterior of the car was to create a premium effect. JUKE is small but that doesn't mean it should look inexpensive or cheap." Proportions, he tells us, are most important. Compact cars generally have small, flat surfaces. JUKE has three-dimensional surfaces and big wheels, giving it a stance like no other car in its size class. Distinctive cars don't usually sell well, but JUKE sold over 10,000 units in its first month, showing that people do, in fact, want more stimulation from their cars. Creating a unique product is key. For Noguchi, the single most satisfying point is the front combination lamp. "The intention of this lamp is that we wanted to put the eyes in a higher position, demonstrating confidence, standing tall and proud. JUKE is small, but easily holds its own, it is not intimidated by larger vehicles." Noguchi concludes that the entire process for JUKE - from initial sketches to the finished product that's available in dealerships, took only three years. For such a distinctive automobile, that is indeed fast. On dispatch from European Satellite Studio NDE (NISSAN Design Europe) Patrick Reimer, an experienced former Interior Designer for a European manufacturer shared his views on JUKE. very affordable, they have achieved such a strong separation from the rest of the market. "I think this is Nissan's way. It is our corporate identity." "Each Nissan has a separate character. We don't make a JUKE A-class, a JUKE off-roader, a JUKE D-sedan. We make a JUKE, we make a CUBE, and we make the Z car. JUKE-ness, each product has its own singular identity. We try to keep concepts very separate - that's simply the way we do it here." "We are happy if we see that customers actually recognise our idea. They look inside and see there's something else going on, it looks different to other cars." On the car's instantly recognizable centre console, “Engineering even proposed to make it in metal, which really impressed me. In the end, ergonomics and safety come first. It has to be safe; you have to have fun driving it." One thing that keeps popping up with this car, following Qashqai, he says, is to make it as up-market as possible, even though it's not that segment - to add something aspirational. It should look as luxurious as possible, he concludes. On fuel efficiency and aerodynamics having an influence on the interior design of the car, he replies; "We had to make it as small and compact as possible but keep the high seatposition. It's very comfortable for the driver, and also contributes to safety. "Cars in the same segment look and feel smaller, he says. "Finding the best balance between what we can offer within the price point is our task. We want the customer to think, "I'm getting more for my money."" For Reimer, the single most satisfying moment on JUKE was winning the project. "We had to prove as a satellite studio that we could do proper projects. I believe we achieved that." "We hope it's the right car for the right era. America's changing, cities are getting more crowded, and cities are key markets for us." JUKE has an unmistakingly strong presence, in terms of both its exterior and interior. 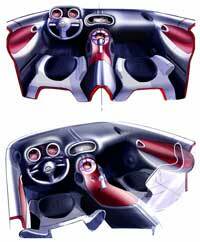 The car's presence is the first thing that sets it apart, then the design details, the accents, the treatments. Something exceedingly rare for a small vehicle, JUKE punches above its weight.